January 16, 2015 January 18, 2015 Categories bearded collie, cattle dog, dog photography, Uncategorizedbeardedcollie, cattle dog, dog photography, heeler, herding dogs, photography, rescue dog, roy, walking with dogsLeave a Comment on They’re Friendly! “They’re friendly.” I always cringe when people shout that as their out of control untrained dogs rush straight towards mine. Because they almost never are friendly, those dogs who are rushing at mine like a speeding bullet. Even if the dog is not aggressive running full speed up to another dog is not friendly behavior its rude. We don’t enjoy interacting with aggressive, untrained or rude dogs, but Im not a freak about dogs approaching. 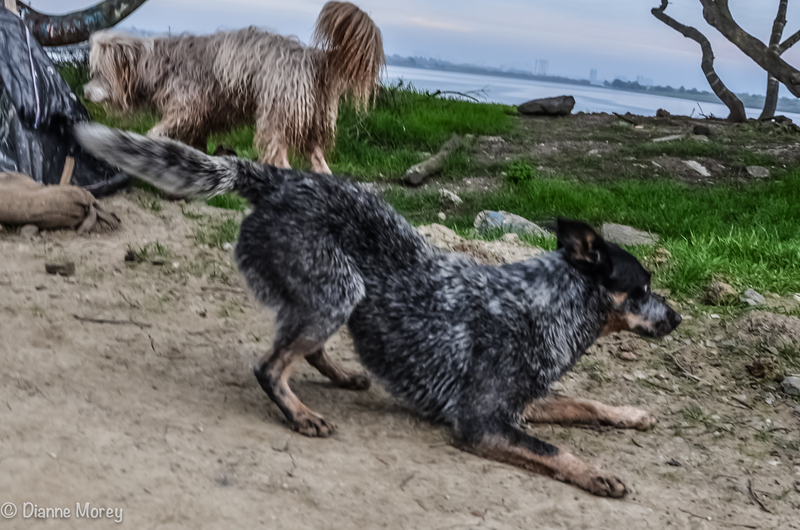 If you’re going to walk off leash trails you and your dogs need to be social and appropriate, you also need to be able to handle a little pressure. Good social skills and a well trained dog can teach other dogs and people a lot. The LOTU dudes are friendly, nice guys who have manners. So when this incredibly cute little black dog bounced over in a super polite fashion to ask what was up, they threw some smooth moves his way. And then it was game on for a minute before we all went on our way.